When XLE turned and XOM lost strength, I got the turn at 2pm EST, also notice USO sold then XLE followed. Also 5 year bonds turned at this time too. Today I held on to a short at VAH and it turned out to be a winner. I missed the buy signal at VAL, but I was still too sleepy to trade. No more trading today, gotta go. Edit: I didn't have time today to do my trade analysis, so here it is. My first trade entry was because I saw a good volume spike in xlf and we were above the VAH, so I made the trade and it was green for a minute, however it turned on me and the trend continued. (At the time I wasn't aware of the strength of XLE and XOM, but I was clearly aware of the strong ER2 trend line yet to be broken.) I should have used a 0.7pt stop, but I decided to give the trade some time and room to work. I then heard from CNBC that XOM was a market mover, so I started watching XOM, XLE, and USO for a turn. I saw that XLF was stalling and XLE was losing steam so I added to my short and then XLE rolled over and ER2 followed. 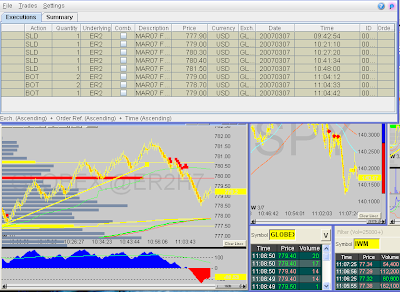 I had preset profit targets at 790 and 789.7 and covered all my cards when I saw a rush in volume at a NYSE tick low. It turns out my trade signals from today would have worked better then my own discretionary trading, which means I really need to do my homework and start working on applying my strategy.